The songbird migration monitoring research conducted by BSBO has documented the timing of spring and fall migration in the Lake Erie Marsh region and has identified the importance of this region for migrating birds. 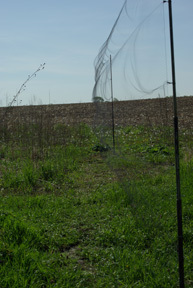 Our biggest research expense is the mist nets that are a vital tool in our bird banding projects. You can help continue this valuable monitoring project by filling out the form below and sponsoring a mist net, or nets! Our banding research is far reaching in that it has brought attention to many in the North American Landbird Management Plan and has identified the Lake Erie Marsh Region / Ottawa National Wildlife Refuge for the huge numbers of songbirds that pass through our area as a globally Important Bird Area by the American Bird Conservancy. With climate change and the need for alternative energy sources on everyone’s mind, the Observatory’s research is now playing a more critical role than ever before. Understanding the importance of this area to migratory birds, and backing it up with documentation, will allow us to pursue green energy in a more responsible, informed and sustainable way. Our long term migratory songbird research data may prove to be one of the greatest ways BSBO can contribute to conservation.